Sir Adrian Cadbury has defined corporate governance as “the system by which companies are directed and controlled”. This is most probably the briefest definition of corporate governance, yet it is so accurate. The beauty of it is that it acknowledges that there is no one size fits all and hence allows for different systems for different companies or different regions. When it comes to the Middle East and North African (MENA) region, Oman was the first country to introduce a code of corporate governance back in 2002. So much has happened since then. This is not to say that corporate governance never existed before that date; many company laws of the region cover board composition and responsibilities to different degrees, but not to the extent required by most regulators in the developed world. Having worked in the corporate governance field in the region and having served as a board member, head of committees and chairman and CEO of various organisations, it has put me in a good position to talk about corporate governance in the region. The question I will try to answer is, ‘what are the key features of corporate governance in the MENA region?’. It goes without saying that what I will say here reflects my own experience; it does not represent the point of view of the organisation I currently head. Despite that countries of the region may differ in some details, they are considered to be still at the early stages of introducing and applying corporate governance, especially on board-related issues. Codes and regulations of the region still mainly focus on introducing ‘non-executive’ directors and that boards should have a majority of non-executives. It is quite rare to see boards with a majority of independent directors. One of the reasons for that could be the type of ownership in companies of the region. Companies are usually owned by large shareholders. Ownership concentration is the absolute norm here. Owners are usually governments, quasi-governmental organisations, families or large individual investors. Therefore, boards of the region are usually occupied by shareholders and/or their representatives. This, of course, has serious implications on the performance of boards and board committees. The frequently observed conflict is between the interests of companies versus the interests of major shareholders. Moreover, many countries of the region have adopted soft approaches to corporate governance enforcement. Governments more often focus their attention and efforts on attracting more foreign direct investment (FDI) and encouraging the opening of new businesses without devoting enough time and effort to improve governance practices. Governments of the region must realise that investors will have second thoughts with the first major corporate collapse. Sustainable economic growth and the steady increase of FDI require a strong and reliable base of corporate governance. Regulators, therefore, to be soft on investors and companies, stop at asking companies for certain reports on compliance with no serious checking on the accuracy of information provided in these reports. This makes corporate governance a matter of box-ticking in some countries of the region. I must mention, though, that many companies set their own standards of corporate governance much higher than the level requested by regulators in their jurisdictions. The largest companies of the region are owned by governments or quasi-government organisations. Such companies operate in strategic sectors such as oil and gas, infrastructure, utilities, aviation, financial services and manufacturing. In almost all countries of the region, there is no one single ownership entity that has clear vision of ownership objectives and policies. Ownership is divided between various ministries, municipalities or governorates. Therefore there is no one governance system for these companies even within the same country or even industry. Despite that, Egypt was the first country in the region to introduce a code of corporate governance for state-owned enterprises (SOEs) in 2006 based on the Organisation for Economic Co-operation and Development (OECD) principles of corporate governance for state-owned assets, still its provisions are not fully implemented. Other countries of the region did not introduce such codes at all. Family businesses are also very common in the region. Family-controlled companies in the region can be quite large, especially at the Gulf Cooperation Council (GCC) countries where many companies are owned by families. Consequently, codes of corporate governance for family-owned businesses and for SMEs are found in different countries of the region, such as the UAE, Lebanon and Egypt. Whether owned by governments or families, many of the companies take the form of ‘group companies’, a holding company and affiliates or a parent company and subsidiaries. This represents a huge challenge in terms of governance. Some of these groups have become that large as a result of nationalisation programmes that took place decades ago or for political reasons; decisions by ministers, or out of greed by owners to make more profits by getting into another profitable business. In other words, the growth and diversification of activities in those companies was not a ‘planned’ growth that took into account synergies and having the right systems in place. Reporting lines, board structures and relationships between companies within the group need to be fixed in many of these groups. The strong presence of state audits, with their usual lack of business sense and with their prime focus on procedural issues only makes things worse. Companies of the MENA region follow the Anglo-Saxon model of single board structure. Boards of the regions are generally between seven and 11 in size, with some variations where some boards may reach 17 or even more while some boards may be as small as five. Boards have a mix of executive, non-executive and independent directors. Executives are usually the CEO and the CFO, while non-executives are usually shareholders and their representatives. When it comes to the ‘independent’ directors, things get trickier as there is no specific definition of independence in most of the countries. Although corporate governance codes of the region refer to the independence criteria set by the International Finance Corporation (IFC), in reality many of those who are labelled as independent do not fit as independent by the IFC criteria. You may find a five per cent shareholder or an executive in an affiliated company or a supply company labelled as independent. Female directors are not very common on boards in this part of the world. It is quite normal to come across boards that do not have a single female director, few boards may have one female director. It is quite rare however to see a board with two or more women directors. A study by Hawkamah, the institute of corporate governance in Dubai, found that only one per cent of boards of listed companies at the GCC are women. The UAE cabinet has adopted a resolution in 2012, demanding that each board of a SOE or government agency is to have at least one female director. Although not fully adhered to, it is a step in the right direction. During the first quarter of 2015, the UAE is to launch an ambitious programme called Women Directors to qualify more women to be able to serve on various boards in the GCC. With some variations, boards of the MENA region meet between four to six times annually, in addition to the annual general meeting. The most common committee of companies in the region is the audit committee. Audit committees have a majority of non-executives. The practice of using non-board members as heads or members of audit committees and other board committees is acceptable and observed in companies across the region, although not very common. In the absence of other committees, audit committees usually play the role of the risk, governance and even remuneration committees. The exception to this is, of course, the banking sector, where most banks of the region follow the Basel directions on governance structures and bank committees. It is worth mentioning that in some countries of the region, banks follow the international best practice in corporate governance voluntarily or as part of the international banking system rather than in response to local regulators or codes. When conducting corporate governance assessments and advising shareowners to make some changes to their boards, we always get this feedback: “We do not have enough qualified people to sit on boards”. The result is that the same directors sit on as many as ten boards, sometimes on behalf of the same owner, usually the government or quasi-governmental organisation. I think, though, that the lack of qualified directors is a universal problem. We want more and more qualified people who can act as ‘independent directors’. One of the positive aspects of corporate governance in the MENA region is the presence of many corporate governance and directors’ institutes. These different institutes work mainly on training of directors, current and potential. Egypt, the UAE, Lebanon, Tunisia and Oman are examples of countries with such institutes. Previously, the Global Corporate Governance Forum (part of the World Bank Group, which has now ceased to exist), put some efforts trying to bring regional corporate governance and director institutes to work together to create the much-needed synergy. Now, with the disappearance of the forum, the OECD is trying to fill in the gap. Linking these institutes together would add value to each one of them as then they can share their experiences, learn from each other and even share material and experts who can deliver director development programs. Transparency is not particularly part of the culture in the region. However, companies are improving their disclosure practices in response to pressures from the regulators. There are currently two environment, social and governance (ESG), indices in the region in Egypt and Dubai. The one in Egypt was launched with Standard and Poor’s in 2010 covering Egyptian listed companies. The second was launched in Dubai also with Standard and Poor’s in 2011, covering large listed companies in the MENA region. The indices rank companies according to the way in which they disclose their ESG policies. Observing companies year after year, they are clearly improving on their disclosure policies. While financial disclosures match those of developed markets, companies still lag behind in non-financial disclosures. What is still missing in most of the cases is information about cross-ownerships, other board memberships, indirect ownership and voting rights. Nonetheless, analysis of share price movements of companies within both indices compared to the rest of the markets clearly indicate that those companies in the index, whether in Egypt or in the MENA region, outperform the rest of the market. Whether this means that investors place weight on better- governed companies or that better-governed companies have more profits and better operational results that is then reflected on their share price, both explanations means the same thing: better corporate governance pays off for companies in the MENA region. 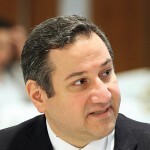 Dr Ashraf Gamal El Din is the Chief Executive Officer of Hawkamah, the institute for Corporate Governance. Prior to joining Hawkamah, Dr Ashraf was the Executive Chairman of Egypt Post. Before that, he was the Deputy Executive Director of the Egyptian Banking Institute, the training arm of the Central Bank of Egypt. He was also the founder and project manager of the Egyptian Corporate Responsibility Centre working on promoting the concepts and application of CSR in Egypt. Furthermore, he was the Executive Director of the Egyptian Institute of Directors (EIoD), the Institute of Corporate Governance in Egypt as well as serving as a board member on several listed, non listed, state owned and family owned businesses in the Arab region.